Sometimes city life is so overwhelming that you feel like a Lenny Kravitz song — you wish that you could fly into the sky so very high just like a dragonfly. You want to get away, you want to fly away, to go so far away that Lenny will wonder if he'll ever see you again. And what better way to escape than exploring the great outdoors? You can bask in the birds, the bees, the flowers, the trees, and the mountains of animal poop. Unfortunately, depending on where you go, a whiff of the icky brown might be the least of your worries. All over the world Mother Nature's beauty is soiled by the horrific things found in it. We're not talking about the typical nature show fare. You won't find lions tearing apart gazelles or giant pythons swallowing whole deer here. This is a different flavor of nightmare — one that tastes like ancient terrors and unexpected ugliness. It's the kind of frightening that would feel right at home in a horror movie. So grab a pillow, hug it tight, and don't turn out the lights tonight because you're about to discover some of the most unsettling things ever found in the great outdoors. Sandwiched between Mexico's southern border and the Caribbean Sea is the Central American nation of Belize. More than half the country is covered with tropical rainforests, per World Atlas. There you'll encounter mangroves, mountains, macaws, "a prehistoric-looking stork" called the jabiru, and one of the world's prettiest sinkholes. 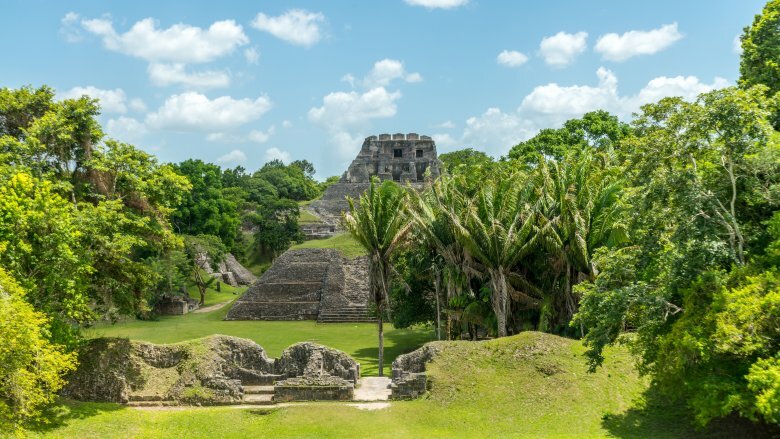 Once the stomping ground of the Mayan civilization, Belize is peppered with temples and caves where Mayans sacrificed other humans to their gods — typically via decapitation and heart removal. It's been said that people have heard "terrified screams" emanating from one of those caves at night. In fact, it was said by the Washington Post in 2015. 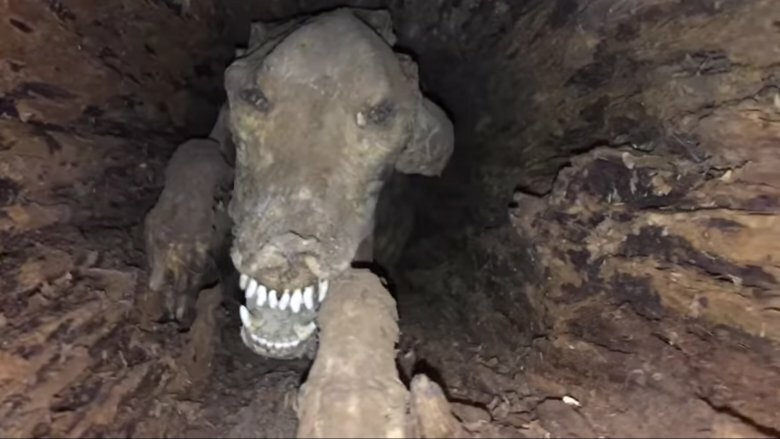 The forebodingly named Midnight Terror Cave is located "deep in the Belizean countryside" and has a 60-foot drop, at the bottom of which rescuers saw a looter surrounded by thousands of human bones. You might wonder whether the screams came from the looter or the anguished ghosts of whomever all those bones belonged to. Or maybe they're the looter's screams in response to whatever those anguished ghosts were doing to him. In all there were about 9,000 bones, and archaeologists believe many of them belonged to children who were sacrificed by the Mayans in the ninth century. Some came from up to 200 miles away, leaving experts scratching their heads about why kids would have been taken that far for that purpose. Merely mentioning the Alps evokes images of frosty peaks, regal-looking mountain goats, and the ginormous horn in those Ricola commercials. The almost 700-mile-long mountain range is a geographical marvel that attracts an estimated 120 million tourists each year. In 1991, two tourists discovered an archaeological marvel. 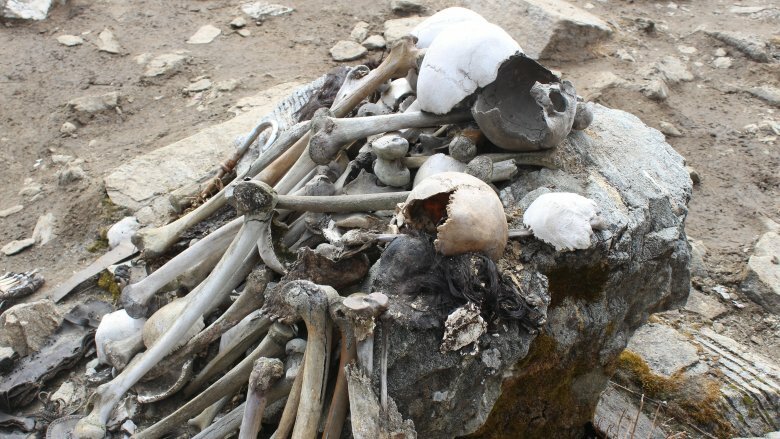 Helmut and Erika Simon encountered an icy corpse (above) while hiking in the Ötztal Alps, The body had been there a while — about 5,300 years — but it was "astonishingly well-preserved," per Live Science. The ancient cadaver, dubbed Ötzi, had skin with visible tattoos, food in his stomach, and physical hallmarks of a homicide. Ötzi's head had been bashed so hard that his brain smacked against his skull, and he likely bled to death from an arrow hitting an artery. Over the years, seven people with ties to Ötzi would suffer awful deaths of their own, leading some to blame it on a curse. While the curse claim is obviously poppycock, some of the deaths were pretty eerie. In 2004, Helmut Simon died in an "unexpected blizzard" near the spot where he found Ötzi. One of his rescuers died of a heart attack "within hours" of Simon's funeral. 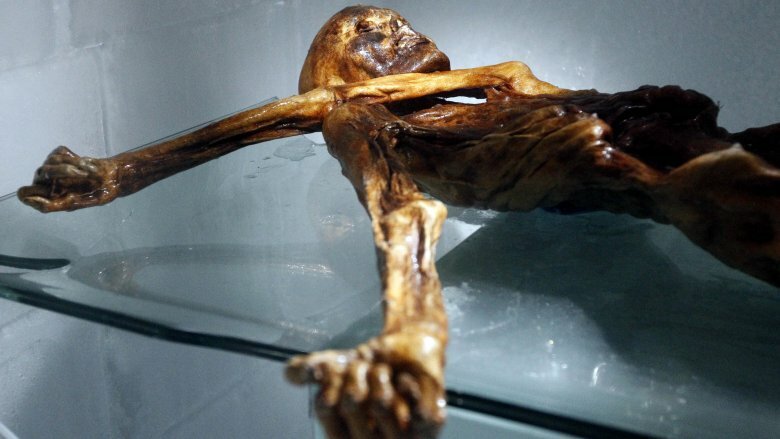 In 2005, a pathologist who handled Ötzi's body died in a car crash while heading to a conference to discuss the ice mummy. Soon after, a mountaineer who moved Ötzi became the sole climber in his group to die during an avalanche. The Geological Society of London described Holyrood Park as "a place of sanctuary from the crowded streets" of Edinburgh, Scotland, "and a piece of countryside within the city limits." With its 150-foot cliffs and freshwater loch, it sounds like a great place to relax after a long week of bagpipe fights and haggis-eating contests. That park's main landmark is an extinct volcano known as Arthur's Seat, which last erupted 340 million years ago. Sitting at 823 feet above sea level, Arthur's Seat is the highest hill in Edinburgh. It was also once a secret cemetery for 17 incredibly creepy dolls. Smithsonian noted that accounts of how the dolls were found vary somewhat across sources, but the gist of it is that in 1836, three boys went poking around Arthur's Seat for rabbits' burrows.' But instead of finding long-eared fluff balls of joy, they found tiny coffins — each 3 or 4 inches long — which contained wooden dolls. The boys destroyed some of the coffins by "pelting them at each other as unmeaning and contemptible trifles," though maybe they were under the spell of Satan's playthings. Per National Museums Scotland, newspapers speculated that the coffins were used for witchcraft or some ancient form of mourning. Experts suggested they were toy soldiers, but nobody seems to know what they are or why they were buried. Bogs have an almost gloomy beauty to them, especially against the backdrop of the gray U.K. skies and other northern climates where they're typically located. Mostly composed of partly rotted plant matter called peat, these freshwater wetlands take hundreds of thousands of years to form, according to National Geographic. Northern Europe has thousands of bogs, and for thousands of years Europeans have used their carbon-rich peat as a fossil fuel. Within that time, untold numbers of people died often violent deaths and ended up in the bogs, where the low oxygen levels and high soil acidity preserved them like ghastly time capsules for archaeologists to study. 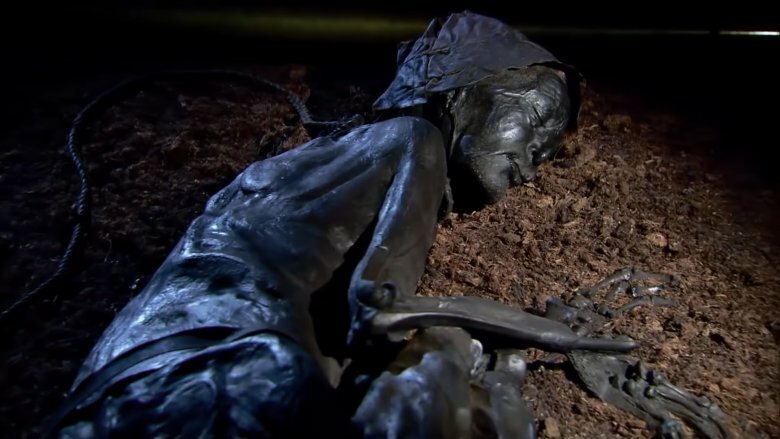 The first known bog body to be uncovered in the U.K. was discovered by a peat cutter working in the countryside in 1984. As the BBC detailed, the man grabbed what he thought was a hunk of wood on a conveyor belt and tossed it aside. He soon realized it was the remnants of a human leg. That detached limb belonged to an almost 2,000-year-old corpse dubbed "Lindow Man." Analyses revealed that "he was killed by blows to the head, garrotting, swallowing mistletoe and then drowning in the waters of the peat bog." Many bog bodies tell similarly grisly stories. They often have "slashed throats" or other "horrific wounds," per National Geographic. Their ugly fates may indicate that they were criminals, slaves, or victims of sacrificial rituals. In southwestern Poland is a place called Lower Silesia, which the New Yorker described as "a land of treasure hunters." 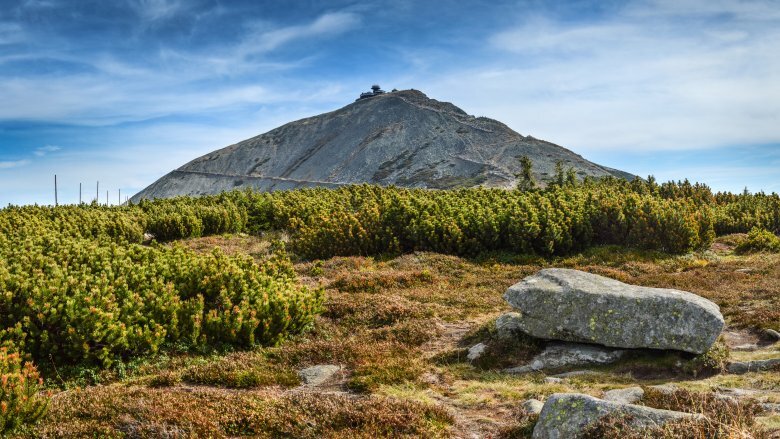 Fortune-seekers believe that under the mountains and "towering, arrowlike trees" of the area's "deep pine forests" are gold, jewels, art, and even sophisticated weapons that were allegedly hidden by the Nazis who occupied Lower Silesia during World War II. U.S. troops did indeed find gold in a mine in 1945, but in 2016 a different kind of find made headlines. As reported by Science in Poland, the partially mummified body of a man was found, not beneath the ground but roughly 80 feet above it in a spruce tree. It had been there for 13 years. The man had on two pairs of pants, which, combined with atmospheric conditions and the inability of predators and scavengers to reach him, kept his body relatively intact. Discussing such a grisly discovery might not sound like a time to mention child rearing, but biologists discovered honeybees, wasps, and a squirrel nesting inside the man. Researchers claim it's the first known example of that happening anywhere in the world. (Presumably, it inspired the world's first nightmare about being stung from the inside by bees and wasps.) Apparently, the corpse resembled the hollow of a tree, making it look like an ideal shelter for bee babies and other woodland offspring. 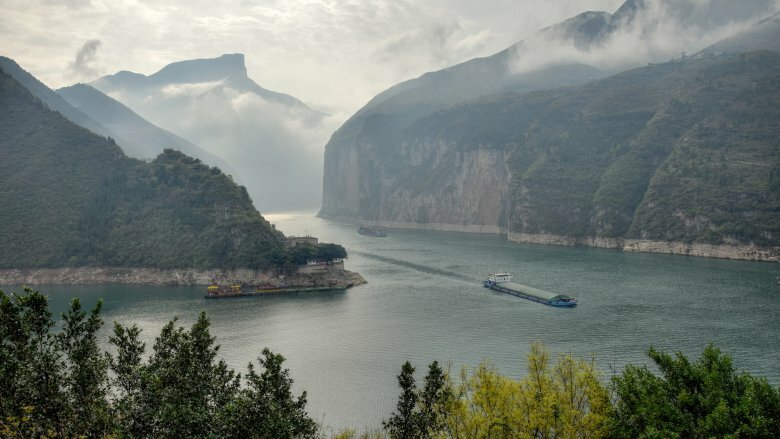 "Yangtze" is Chinese for "child of the ocean," per Live Science, but it's a name predominantly used by Westerners in reference to the mother of all Asian rivers. Stretching over 3,900 miles, the Yangtze is Earth's third longest river. It's so massive that most Chinese people apparently just call it "Chang Jiang," or "long river." Navigating this gargantuan waterway will provide you with breathtaking views of China's many mountains and cliffs. In 1982, the UNESCO World Heritage Centre recognized the Three Gorges portion of the river as one of the most scenic spots on the planet. Three years later Wong How Man, then a journalist for National Geographic, saw something along the Yangtze that some might call unsightly. Wong saw coffins mounted 300 feet high along the cliffside like morbid ornaments, and they definitely weren't empty. Known as "hanging coffins," they were placed on wooden stakes or inside caves. Wong soon became obsessed. "At first, it was simply how the hell did they get there," he recalled, "and then I couldn't stop thinking about why." 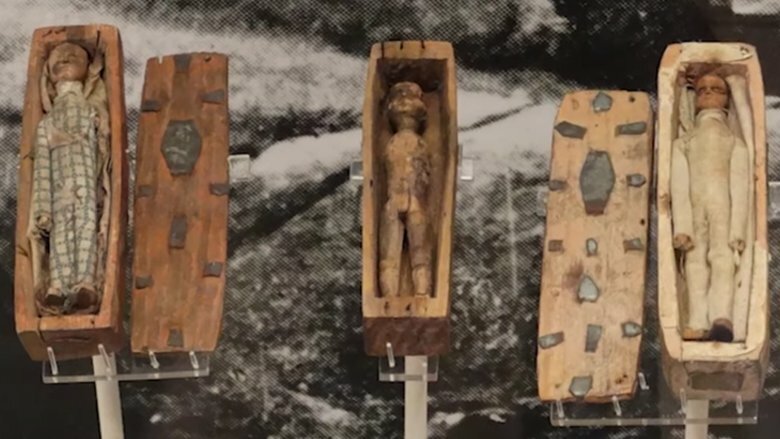 Researchers determined that the oldest hanging coffins go back about 3,000 years, and writings from the Tang dynasty indicate that a higher elevation signified greater reverence for the deceased. In some cases, coffins contained multiple corpses. Exactly how they were mounted remains a mystery. The Himalayas are a grim sort of gorgeous. Their name, which means "abode of snow" in Sanskrit, has an almost musical quality that can't quite convey the deadliness of this roughly 1,500-mile mountain range. The most famous Himalayan mountain, Mount Everest, doubles as an outdoor morgue for unfortunate climbers. But at least these people met their end trying to conquer the world's greatest physical obstacle. Elsewhere along the range there's a valley full of bodies who never had a choice or even a chance to survive. In 1942 a British forest guard in Roopkund, India, found that place, a frozen lake 1,600 feet above sea level. Per Atlas Obscura, it was full of human skeletons. In the summer the lake thawed, revealing even more corpses. The body count exceed 200, and with World War II raging, British officials thought the guard had found the remains of Japanese soldiers. In reality, the bodies dated back to 850 A.D. In 2004, researchers would determine that they died in a one-sided war between man and nature. The bodies had "deep cracks" in their skulls and shoulders from some rounded object that struck them from above. Scientists ultimately concluded that they died in a hellacious hailstorm. 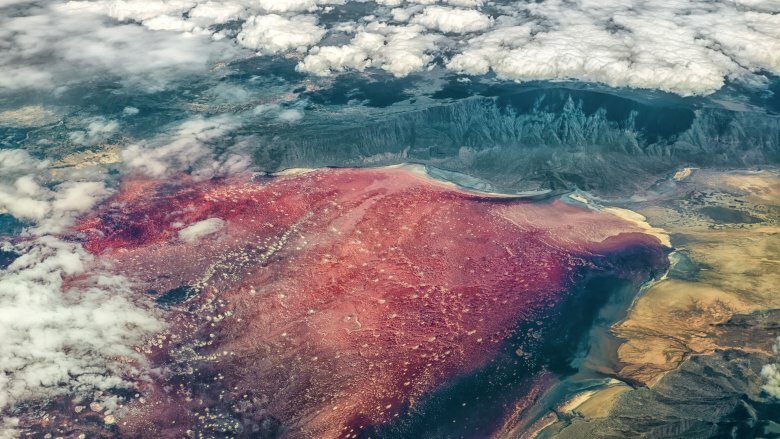 In northern Tanzania there's a natural anomaly named Lake Natron (above). Described by Atlas Obscura as a "salty red hell," this unusual body of water turns blood-red from the algae that thrive in it, and it can reach temperatures of 120 degrees. Per Smithsonian, the lake has a pH as high as 10.5, making it comparable to ammonia. Its special composition comes from a chemical called natron, which is basically baking soda mixed with sodium carbonate. According to Live Science, Lake Natron "is so caustic it can burn the skin and eyes of animals that aren't adapted to it." Though it's home to crimson slime and endangered flamingos that breed there, few creatures can live in this highly alkaline lake of fiery temperatures. A lot of things can die in it, though, and when they do, their bodies are mummified by the salty waters. The process isn't instant, the way some news outlets have suggested, but it's surreal all the same. Photographer Nick Brandt was visiting Lake Natron when he happened upon the un-rotting carcasses of birds and bats. "I saw entire flocks of dead birds all washed ashore together," Brandt recalled. He spent three weeks paying locals to collect dead birds for him to pose and photograph. "They thought I was absolutely insane," he said. 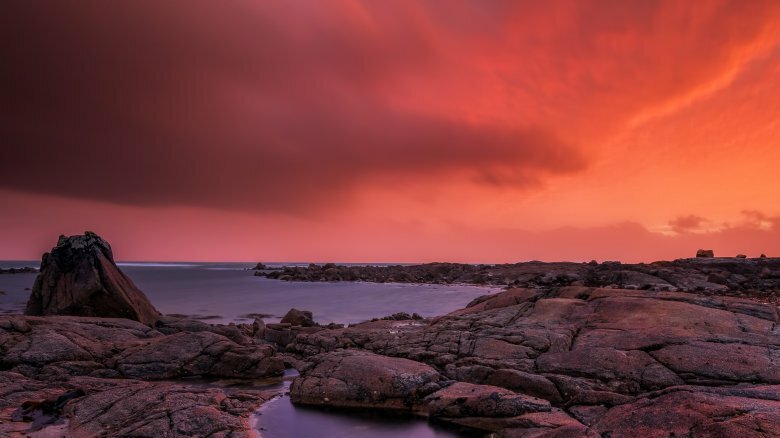 Ireland's western coast is called the "Wild Atlantic Way," and for outdoorsy types it's basically 1,500 miles of natural eye candy. If you've been there or Googled pictures of it, you've probably seen the abundance of lush hills, cliffs, castles, intensely hued skies, rocky islands, and stunning views of the water. There are also much less stunning views of trees in fields. But in 2015, something stunning emerged from underneath one of those unremarkable arbors after the wicked winds of a storm uprooted it. As History detailed, buried beneath a beech tree were the old bones of a young man. According to archaeologist Marion Dowd, when the tree fell, "it snapped the skeleton in two," with the top half attached to the roots and the lower half still in the ground. The man was likely between 17 and 20 years old and died sometime between 1030 and 1200. The tree, which was 215 years old, was probably planted without any knowledge of the body. Cuts on the skeleton's rib cage and hand suggest the man was stabbed to death, though it's not clear why he wound up in that spot. Records show that there was once a cemetery around there, but no other burials were found near him. Ah, Antarctica, also known as "Aaaaaaah, Antarctica!" You may know it for its blinding icy whiteness, deadly crevices, 200 mph winds, severely limited internet, and the fact that people go crazy there — likely due to the lack of internet. 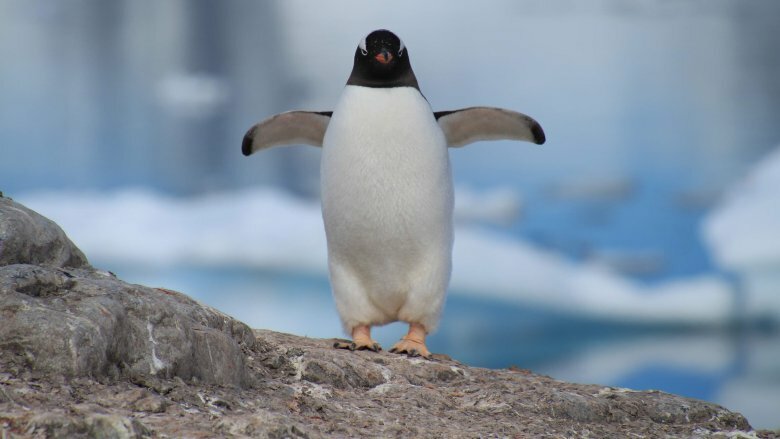 You may also know Antarctica for penguins, nature's cutest crime victims. Those waddling slabs of sadness lead exceedingly harsh lives wherein they kidnap each other's young, carnally violate one another, and have been been boiled for lamp oil. In 2016, Antarctic darkness and penguin peril combined like a sinister Captain Planet, giving scientists more reasons to dread Antarctica and feel even more sympathy for penguins. As reported by Live Science, a team of researchers on East Antarctica's Long Peninsula came across an area littered with hundreds of mummified penguins, most of them babies. They also found poop because penguins deal with a bunch of crap, including and especially their own. There are many ways a person might react in that situation, and most of them involve teardrops and expletives. But the scientists sought to determine what caused all the awfulness they saw. The evidence pointed to two separate waves of extreme weather and flooding, one of which occurred roughly 750 years ago and another that happened about 200 years ago. Professor Liguang Sun explained, "It is quite likely that global climate warming caused enhanced precipitation, which led to the tragedy." Found throughout the Eastern United States, the chestnut oak tree is unique among oaks in that it can live on "steep, rocky" terrain. Though chestnut oaks are known for their "beautiful silvery-white bark," one in particular became infamous for a different, darker kind of bark in 1980. 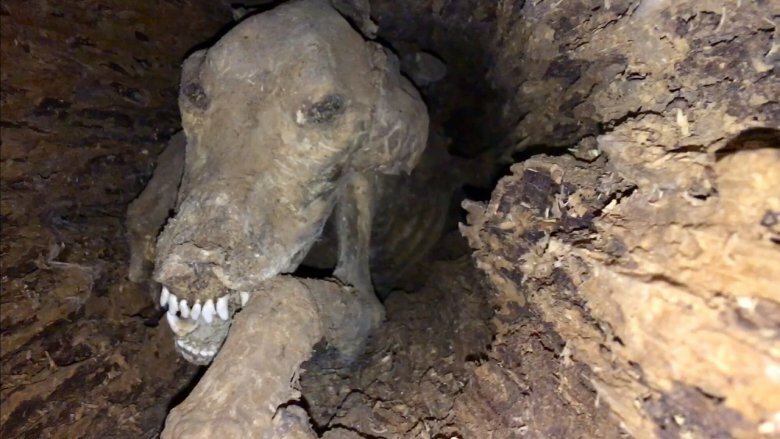 A group of loggers lopped the top off of a chestnut oak and saw something unsettling in the hollow log section: the open-jawed grimace of a mummified hunting dog. Poltergeist taught us that demonically possessed trees eat people. Do they eat dogs, too? Did the loggers uncover the sinister dinner of a devil tree? No. Sadly, that extremely unlucky canine climbed through the bottom of the tree in 1960 and got stuck in the narrow opening 28 feet off the ground. Why didn't the dog decompose? Biological anthropologist Kristina Kilgore explained chestnut oaks produce tannin, which removes moisture and is used to prevent pelts from rotting. Additionally, an updraft inside the tree likely produced a "chimney effect," blowing away the pungent aroma of death and keeping corpse-eating creatures from smelling it. The dog-filled log was sent to a tree museum called Southern Forest World, where it holds a "place of honor." After a 2002 naming contest the dog was dubbed "Stuckie," which is both a morbid pun and an unappetizing allusion to "pecan logs," a nougat-filled confection sold by Stuckey's convenience stores. Presumably, Stuckie is the chestnut oak log's "nougat" filling.